Officials in Rockland County New York have imposed a 30-day state of emergency that bans unvaccinated minors from public spaces. The move comes after Rockland reported 153 measles cases, 84 percent of which were found in people 18 and under. Officials say the move is mostly to get public attention and hold parents accountable, but if parents are caught with an unvaccinated child in public they could receive up to six months in jail or fines of $500. Officials in Rockland County New York declared a state of emergency on Tuesday that effectively bans all unvaccinated children under the age of 18 from being allowed in public places. The state of emergency is set to last 30 days until April 25. This means that unvaccinated minors cannot be in a public space until they receive at least one vaccination for measles, mumps, and rubella (MMR), or until the 30 days are up. The declaration defines a “public place” as anywhere in public where more than ten people are congregated. Notably, that includes schools, stores and restaurants, places of worship, and public transit. The only exceptions to the ban are for the purpose of medical care, immunizations, and public appearances required by law, like attendance at court. However the declaration does require parents or guardians to call in advance and inform these places that their children are unvaccinated. While there is no way to formally enforce the ban, officials have said that that not really the point of the declaration. In a press conference, Rockland County Executive Ed Day said that the move is intended to get people’s attention and hold parents accountable. 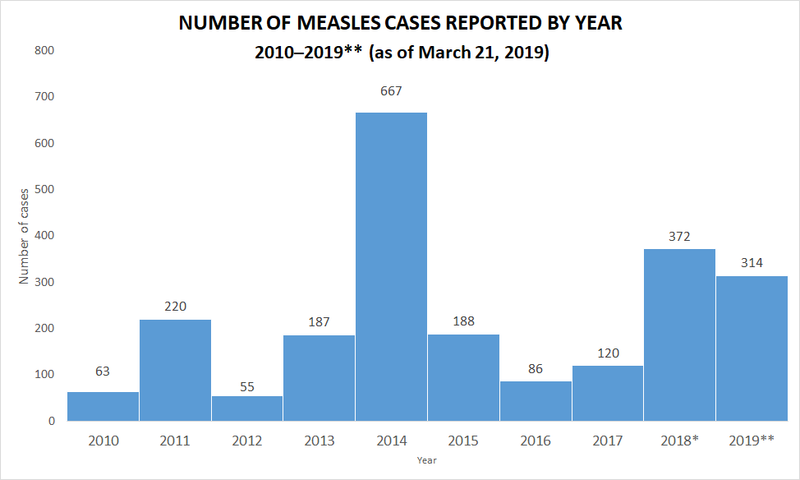 Following the initial reports in January, nearly two out of every three of all measles cases were in Rockland County, which had reported at least 105 cases at the time. In response to the outbreak, Rockland closed more than two dozen schools and daycare centers that had low vaccination rates. In order for vaccines to be effective, around 90 percent of people have to be vaccinated. In January, it was reported that some private schools in Rockland County had vaccination rates around 50 percent. However, since January, the situation in Rockland has only gotten worse. As of Mar. 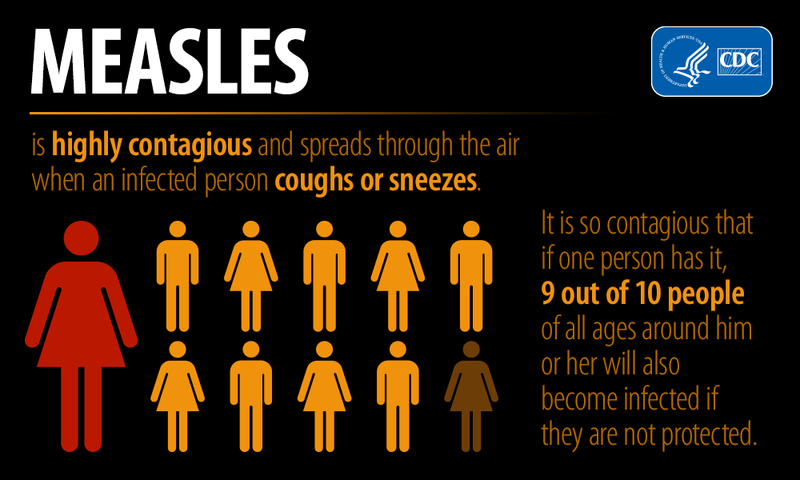 26, the county reported 153 confirmed cases of measles. Of those confirmed cases, over 84 percent were 18 years and younger, and 82 percent of people infected had never received an MMR vaccination. While some have said Rockland’s ban is extreme, the county has tried a wide variety of actions for months, and the outbreak has only spread more. In addition to the executive order that pulled nearly 6,000 unvaccinated children out of schools, Rockland County has also administered nearly 17,000 doses of the MRR vaccine over the course of 26 weeks. There was also a public health campaign during which community officials, doctors, and rabbis all testified about the importance of immunizations. Rockland has increased their vaccination rate, but only 72.9 percent of kids between the ages of one and 18 are vaccinated in the county, according to Day. Day also said that when county officials tried to trace the outbreak, members of the community dismissed them, refused to answer questions, and hung up their phones. Many public health officials have said Rockland County’s actions make a lot of sense. However, unsurprisingly, the ban of unvaccinated children in public spaces has already received some backlash. The outbreak is more widespread in the Orthodox Jewish community, which has a lower vaccination rate, according to Day. A Rabbi Yakov Horowitz, who founded a yeshiva in Rockland, said while he strongly supports vaccinations, he was also concerned the declaration could lead to potential harassment and discrimination against ultra-Orthodox Jews. Some public health law experts are also concerned that the declaration infringes on civil liberties. Lawrence Gostin, a professor of global health law at Georgetown University, questioned whether or not the move was constitutional. “This is virtually imprisonment of a child, and certainly significantly restricting the child’s liberty,” said Gostin. However, similar decisions in Rockland have been upheld in other cases. Back in December, Rockland banned unvaccinated students from schools where less than 95 percent of the students were vaccinated. A group of parents responded by suing the county health department, but a federal judge ruled the school ban could stay earlier this month. That said, this constitutional argument could be persuasive to anti-vaccination groups that would want to challenge the declaration, even if it only is for 30 days. This is significant because Day has said he believes Rocklands ban is the first of its kind the US, and a number of public health experts have backed up that claim. If Rockland’s prohibition works, it could set an example for other counties and states.